Below you will find FSB Scholarship Past Questions for Nigerian students who have applied for the Federal Government FSB Scholarship. It is important to note that these are simply FSB past questions and therefore, should be studied as what they are, which is simply past questions. The Federal Scholarship Board (FSB) is an arm of the Federal Ministry of Education – Nigeria and FSB is responsible for coordinating the disbursement of scholarship to Nigerians home and abroad. Here are FSB scholarship past questions from past Federal Scholarship Board (FSB) examination exercises. A downloadable PDF document of the FSB scholarship past questions is available below. The following are 10 FSB examination sample questions to give you a quick idea about what the exam is like. You will find that the questions are quite simple. 1) The average ages of three persons is 27 years. Their ages are in the proportion of 1:3:5.What is the age in years of the youngest one among them. 7) Which of the following numbers is divisible by 3, 4, 5, and 6? 9) Look at this series: 8, 6, 9, 23, 87 , … What number should come next? These questions were set in previous Federal Government Scholarship Board (FSB) Examinations. The FSB exam is organized by JAMB and their questions always include analogy, arithmetic, current affair, IT, Verbal and Quantitative Reasoning and English Language. Also note that it is not JAMB UTME but JAMB aptitude test or recruitment exam. The Federal Government of Nigeria through the Federal Ministry of Education through the Federal Scholarship Board offers the Bilateral Educational Agreement (BEA) Oversea Scholarships to Nigerian undergraduate, masters and doctoral students. The BEA Awards are scholarship awards made to eligible Nigerian youths after due process by development partners who have entered into Bilateral Educational agreement with Nigeria. Nigeria equally offers reciprocal awards to citizens of the following Bilateral Education Agreement countries: China, Romania, and Cuba. The Honourable Minister of Education (HME) usually annually invites interested and qualified Nigerians to participate in the Nomination Interview for the Bilateral Educational Agreement (BEA) Scholarship Award tenable in Russia, China, Morocco, Turkey, Algeria, Romania, Serbia, Japan, Ukraine, Cuba, Greece, Czech Republic, Syria, Macedonia, Mexico, Egypt, Tunisia etc. Federal Ministry of Education Overseas Scholarships is for Undergraduate, Masters and PhD Nigerian Students. – $500 monthly for supplementation. – $250 yearly for warm clothing. – $200 yearly for Health Insurance. – $500 yearly for medical scholars only. – $1000 for PG research grant yearly were applicable. 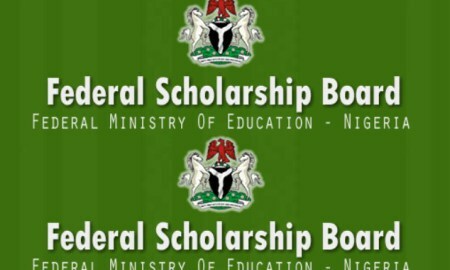 The Federal Government of Nigeria through the Federal Ministry of Education through the Federal Scholarship Board offers Local Scholarships to Nigerian undergraduate, masters and doctoral students who are studying in one institution or the other within Nigeria.